Immigrant sanctuary struggle continues in Minneapolis, Sheriff Stanek lashes out | Fight Back! 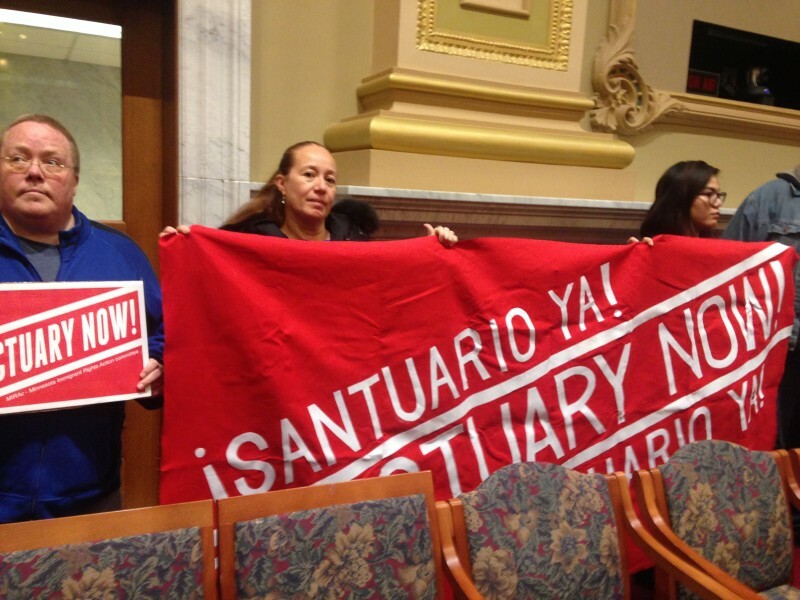 Minneapolis, MN - Immigrant rights activists demanded “Sanctuary now!” at the Minneapolis City Council meeting Oct. 6. The activists gathered outside of City Hall then made their presence felt in the City Council chamber, holding their banner and signs at the start of the council meeting. 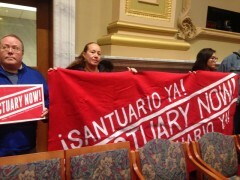 The visibility action was part of an ongoing campaign demanding that the Minneapolis City Council quickly pass the Sanctuary Platform. Adopting the platform’s 13 demands would deepen Minneapolis' commitment to standing with immigrant communities that are under attack. The Sanctuary Platform was initiated by the Minnesota Immigrant Rights Action Committee (MIRAC), and has been endorsed by many immigrant rights organizations, unions, social justice and religious groups. It has already attracted support from some current city council members as well as several of the candidates running for city council and mayor in the November election. The platform was launched with a community press conference before the prior City Council meeting on Sept. 20. A day later, Hennepin County Sheriff Stanek sent a 3-page letter to all City Council members that can be read as both defensive and threatening. Stanek’s close cooperation with Immigration and Customs Enforcement (ICE) in the county jail is a target of some of the platform’s demands. Stanek’s letter says, among other things, “there is no sanctuary for criminals anywhere in Hennepin County” and brags that in 2016 his jail arranged for ICE to talk to approximately 2700 people detained in the county jail. Stanek’s letter was made public by Minneapolis City Council member Cam Gordon (Green Party). That has focused wider community and media attention on Sheriff Stanek’s close cooperation with ICE that results in many deportations, directly undercutting the Minneapolis’ stated goal of being a safe city for immigrants. Activists at the action vowed to keep the pressure on the city council and the mayor to unite against Stanek and Trump’s attacks on immigrants.